First, to all have a good LABOR DAY HOLIDAY. Today in Sigma History will resume on September 5, 2007. 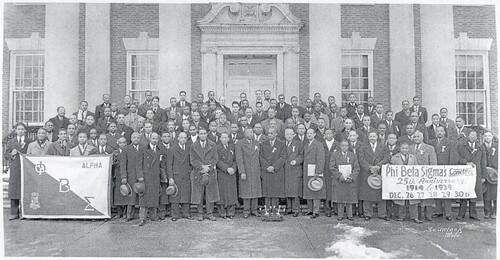 I actually have an copy of this picture taken from the January 1940 Edition of the Washington Afro-American Newspaper. It’s in bad shape and about to crumble apart, but I managed to frame it, not sure if I can get a newspaper picture restored. There are a number of unique facts about this picture that have been passed down. At Founder Taylor’s feet are two Sterling Silver Candle Holders that were given to him by the Fraternity marking the 25th Anniversary (Silver Anniversary). The candle holders were engraved “To Founder A. Langston Taylor marking the Silver Anniversary of Phi Beta Sigma”. This was told to me by Bro. Francis L. Hall. Brother Hall also believed that these two candle holders are still in the Washington, DC area somewhere??? Man, if we can find those! The Alpha Chapter Sigma Banner in the picture was found in 2004. The banner came from the collection/estate of Bro. Col. Robert L. Pollard (Alpha Chapter 1919). I often wonder if any of the brothers in this picture are still living? The Photographer of this picture, Addison Scurlock, was one of the most noted Black Photographers in the Washington, DC Area. His pictures captured notable black history events from the early 1900’s until his death in 1964. He is noted for many of the early fraternity/sorority pictures that came out of Howard University.